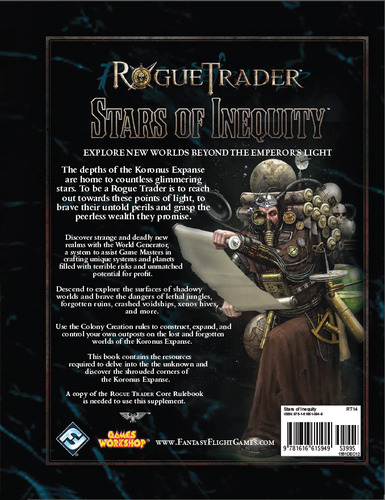 Stars of Inequity is a supplement for Rogue Trader that presents tempting new opportunities for those brave few who make their livings in the Koronus Expanse. This detailed resource focuses on the perilous worlds of the Expanse. Game Masters can create their own new realms with the World Generator, a system designed to craft unique planets filled with terrible risks and unmatched potential for profit. Players can brave the dangers of planetside missions, crossing the surface of shadowy worlds to explore deadly jungles, ancient ruins, crashed voidships, and more. 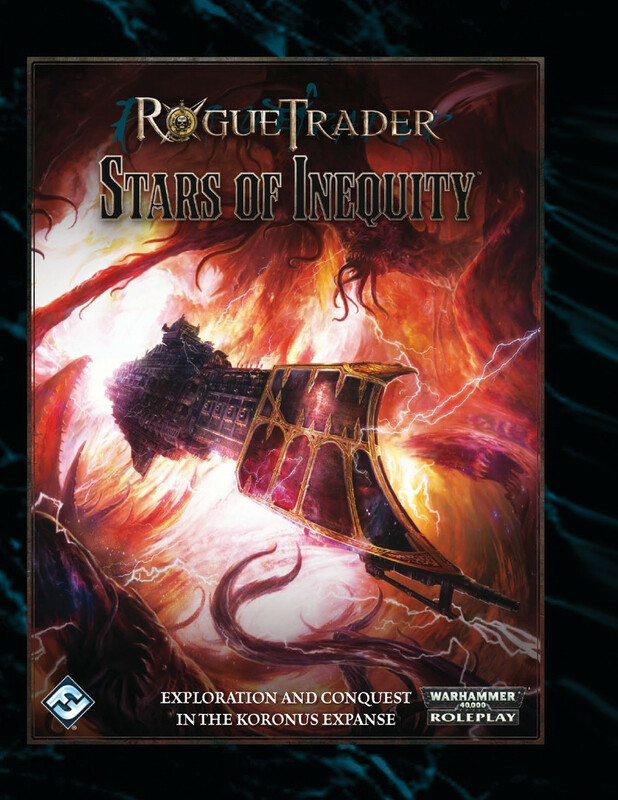 And with the Colony Creation rules, your group can construct, expand, and control its own outposts on the lost and forgotten worlds of the Expanse! This is not a complete game. 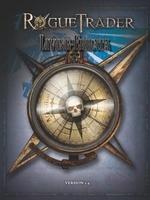 A copy of the Rogue Trader core rulebook is required to play. Playtest Coordinator Ronald DeValk. "Unrepentant" Lachlan "Raith" Conley with Aaron Wong, Mark McLaughlin, Jordan Dixon, and Fiona Coath. "You Bid Babies?!?" Jordan Millward with Keri Harthoorn, Kyle Harthoorn-Burton, Kieren Smith, Julia Smith, and Malcolm Douglas Spence. "No Guts No Glory!" Adam Lloyd with Sean Connor, Ben Newman, Simon Butler, Vernon Schlegel, and Mat Westcar. "The Librarians" Pim Mauve with Gerlof Woudstra, Keesjan Kleef, Jan-Cees Voogd, and Joris Voogd. Ryan Powell.